Reports of Dismal Barramundi Fishing on the Kimberley and Top End Coasts. I’ve spoken to quite a few people this year that have come home from the Kimberley Coast, the Darwin Rivers and Van Dieman Gulf regions with few or no Barra in the bag after fishing the end of the wet season – usually a great time for Barra. Without exception, everyone has mentioned the lack of rain this wet season as the cause of so few Barramundi around the normally productive creek and river systems in these areas. On the other hand, I’ve heard good reports about catches of reefies and pelagic’s, which it seems haven’t also been adversely affected by the low rainfall experienced in the 2013 wet season. There are also reports of lower than normal fresh water flows in many of the big Kimberley Rivers, including the King George, The Berkeley and The Drysdale. But who cares – even if you catch none, being there is still fantastic. Members Beware of Increased Fisheries and Department of Conservation Presence in Kimberley Coast Waters. The new Camden Sound Marine Park will bring an increased presence of Department of Fisheries (Fisheries) and Department for Environment and Conservation (DEC) Rangers and patrol vessels into the Kimberley coast, particularly around the proposed marine park, which covers a huge area between Yampi Sound and The Prince Regent Sound on the West Kimberley coast, including some very popular cruising destinations frequented by Kimberley coast cruising vessels. No date has been set for official gazetting of new park. We will post the info here when it made an official and legal park. Skippers and crew of cruising vessels should make themselves aware of the soon to be introduced zones in the new park, particularly relating to restricted fishing areas and whale watching. They should also be aware of the requirements for Fishing off a Vessel Licenses required in all West Australian waters for private fishers who fish from a vessel. There are also very strict possession limits which apply to fish found on board a cruising vessel. You can download the information from these links. Recreational Fishing Guide 2013. This pdf document includes species bag limits and the rules applicable to recreational fishing in Western Australia. Copy it and keep it on board. Application for Recreational Fishing Licenses in Western Australia. 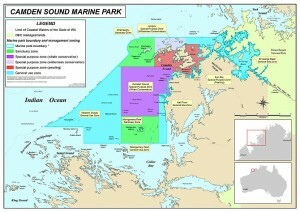 Camden Sound Marine Park Map. Berkeley River Lodge Plans to Build Airstrip at their East Kimberley Coastal Resort. Reliable sources have told me that the Berkeley River Lodge is planning to build a 1400 meter airstrip adjacent to the Lodge for the 2014 dry season. This will not only make access to the lodge easier for their guests, but opens up the opportunity for the Lodge to supply accommodation to the many private aircraft owners and aero clubs that want to fly into the Kimberley coast, but currently have very limited places to land light aircraft. (The ones without floats that is). Friends of “R&R” are already planning to fly their own aircraft in next dry season, stay a few nights at the Lodge, then join us on board “R&R” for a cruise around the East Kimberley, and they can feel secure that their aircraft can be safely left at the Berkeley while they are on board. The airstrip will be a fantastic asset for the Lodge and is bound to add to the success of this wilderness destination. Date set for the Kimberley Coast Cruising Yacht Club’s 2013 Annual Beach Party – 10th July 2013. There was an impromptu get together of 6 KCCYC “Kimberley Members” in Darwin last week, and following a few beers at Buzz Cafe and a few wines with a great meal at Yots Greek Restaurant in Cullen Bay Marina, we all decided to meet in the Berkeley River about 8th or 9th July for the clubs second ever Annual Beach Party. Given that part of the race fleet from the Fremantle Sailing Club’s Fremantle to Bali race will be cruising back to Perth from Darwin via the Kimberley Coast, and by amazing coincidence will also be in the Berkeley River at the same time, it was considered a good idea to hold the party on Wednesday 10th July, and invite all crews from all boats in the Berkeley on the day. I contacted Jodie at the Berkeley River Resort, and provided they are not busy with paying guests that day, they are happy to let us use the resort’s bar for the party and BarBQ. If they are busy on the day, we will simply have to find another spot to hold the Beach Party. This of course, is in keeping with KCCYC philosophy of not trying to organise too much. I also told Jodie that any guests and staff at the resort on the day are welcome to join us at the beach party. Anyway, the date has been set, (but can still be changed by popular demand) and I feel extremely confident that everything will fall into place, and everyone will have a fantastic day. I will keep you posted on any news related to the Beach Party through the club’s website News and Events page, the online forum and perhaps an occasional email newsletter. Hope to see you there on 10th July. Fremantle to Bali Race and Rally Fleet to Cruise Home Through The Kimberley. Fremantle Sailing Club is holding Western Australia’s only international yacht race, the Fremantle to Bali Race and Rally, due to start on 4th May, 2013. So far there are 60 entries, with more expected. The event is not just a blue water sailing race. Most in the fleet will continue on after the race on an organised cruise through the East Indonesian Archipelago, then back to Darwin, where some vessels will join the Sail Indonesia Rally. Many more in the fleet plan to cruise leisurely back to Perth via the Kimberley Coast, leaving Darwin for the Berkeley River around 8th July. A few of the race and rally skippers have already become members of the KCCYC and hopefully there will be more joining over the following weeks. No doubt there will be some boats visiting the Darwin Marinas to enjoy the Darwin lifestyle and make use of the marine facilities to carry out repairs and maintenance after what will be a long race and cruise. Please make them welcome if you are in Darwin at the time, particularly if they are wearing a KCCYC shirt, or their yacht has a KCCYC burgee flying, or sticker displayed. For those of us blessed with being on the water in the Kimberley when they cruise through, let’s go out of our way to make them feel welcome. Keep an eye out for yachts flying the KCCYC burgee and give them a “Sundowners @ 5” call on 16. New Pages to be Added to Club Website. After 4 months in the Kimberley, Ros and I are unfortunately back on dry land as of September 2012. But I’m also back in internet range, so it’s time to start adding more content to the club website. The plan is to add an “Anchorages” page and a “Photo Album”. I have a few people recruited to help me with content for the anchorages and you will start to see information added from November. I am working on the format for the anchorage pages, with the goal being for members to print the pages themselves and create a booklet to take with them to the Kimberley. Each anchorage will include standard info such as Lat Long, routes for entrances into rivers/creeks/bays etc, suggested anchorage way points and/or Google maps showing the suggested anchorages at each place, description and hints/advice about any hazards and tides, things to do and see, such as dingy trips, walks, fishing, art, swimming holes, fresh water etc, and a brief story on any history of the anchorage or nearby region. Photos will be included if available. Members will be encouraged to contribute to the list of anchorages by providing information on their own favorite places to visit, and make additions, amendments and corrections to the existing information on pages contributed by others. Inaugural Annual Beach Party, a quiet but fun day. Four boat loads of members and friends who were planning to be at the beach party had to pull out for various reason, three because they needed to exit the Berkeley before strong winds locked them in the river. But a great day was had by those of us who made it. The Berkeley River Resort invited us to use their bar and restaurant for the party. We enjoyed a Bar BQ lunch and quite a few Matsu Brewery beers and excellent wines at the bar. After lunch we toured the resort and chartered their chopper for a flight over the Berkeley and surrounds. The chopper flight ended a great afternoon for us. The chopper is a must do the next time you are in the Berkeley!! Many thanks to the staff at the Berkeley Resort for their hospitality. Berkeley River Resort Joins the club. There’s a very limited number of places on the Kimberley coast where it’s worthwhile taking your wallet with you when you hop in the tender to go ashore. The Berkeley River Resort is one of them. Welcome to Jodie Mott, Manager of the Berkeley River Resort, who has joined the KCCYC as the resort’s representative. Jodie has extended an invitation to KCCYC members to pay her a visit for a drink at the bar, or a meal in their restaurant when you next drop the pick in the Berkeley. Marion and Phil of “The Squatters Arms” fame join the club. The KCCYC welcomes Marion and Phil as members. Anybody who has spent time cruising the Kimberley coast will know Marion and Phil from the “Squatters Arms”. They live on an idyllic little headland in the upper reaches of Silver Gull Creek in Yampi Sound. Check it out on Google Maps. Phil and Marion are true “Kimberley Characters.” Their home is built right next to a concrete water tank, which was long ago abandoned by BHP, and has now been “renovated” as Phil and Marion’s private indoor swimming pool, constantly replenished by a sweet water spring. Yachties are welcome to top up their water tanks from the spring’s overflow. They welcome cruising yachties. It’s also a favorite spot for the charter boats to visit and they could be swamped with punters, so its good manners to give them a call on VHF Ch16, call sign “Silver Gull Creek”, before you head up for a beer (BYO) and a refreshing swim in the tank. Also take your wallet, because Marion has a small jewelry shop stocked with their own hand crafted and imported items. Some of my wife Roslyn’s favorite necklaces came from Marion. Keep your eye open for the "Silver Gull salute" when you are leaving in your dingy. Three Boats Leaving Airlie Beach for The Kimberley in May 2012. Grant Shorland, family and friends on “Iron Prince”, a 63ft Alan Barnett steel passage maker. These three vessels are scheduled to leave Able Point Marina around mid May on a 3-4 week passage to Darwin, then onto a 2-3 month cruise of the Kimberley coast.“R&R” will be staying permanently in Darwin after the cruise, with “Mabuhay” and “Iron Prince” returning to Able Point Marina at the end of the dry season. Good luck and happy cruising to all on board. Annual Beach Party at Berkeley River 4th July 2012. The inaugural KCCYC “Annual Beach Party” will be held on the beach just inside the Berkeley River mouth on Wednesday 4th July.The celebrations start around lunchtime and end before dark so party goers can return to their mother ships while they can still see the crocs. BYO lunch, snacks and drinks. Members, please wear, or bring your KCCYC polo shirts for a photo opportunity. Members and non members are welcome to come along to help make this unique event a success. Spread the word to any boats heading to the Kimberley. Staff and guests from the brand new Berkeley River Resort have been invited to join the party. They are also positive about offering Members accommodation packages for next year’s Annual Beach Party to Members who want to come to the party, but don’t have a boat to get there on the day. Darwin to Dili & Darwin Kupang Rallies start in July. These two popular Darwin to Indonesia sailing rallies start on the 14th and 28th of July respectively. With well over 100 yachts gathering in Darwin from June to get ready for the rallies, there is a shortage of berths available in all the Darwin Marinas. If you need a berth in Darwin during late June and July, book it well in advance. The up side is that they are generally a very sociable bunch of cruising yachties, and if you are cruising up the Queensland Coast and over the top to Darwin when they are also heading for Darwin, be prepared for the odd on board party or two at overnight stopovers.